﻿Over 25 years of demonstrable experience in managing and conducting all manner of intricate and high level investigations, providing specialized security consulting services and conducting training and consulting services for the law enforcement and security services industries. Covering all of New York State. Fodera & Associates, LLC. provides the highest level of service expected from our esteemed clients. We do not perform at the level of most other investigative firms, we outperform and overachieve on each and every assignment. Our clients return to us time and time again, because they know that we offer incomparable investigative services at highly competitive rates and that our service simply outperforms our competition. Having experienced the service level provided by other investigative service providers, and with significant time and experience speaking with end-user clients, we know what the client expects, how to provide that service and how to build and grow a mutually beneficial business relationship with each client. 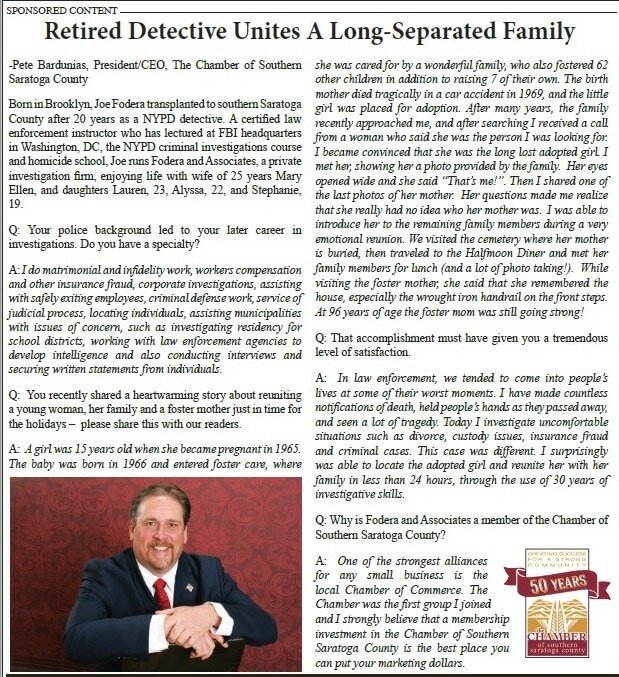 When you contract with Fodera & Associates, LLC., I put my name and reputation on each and every investigation, on each and every security related service and on each and every law enforcement training session and consulting service, therefore, I have to hit the mark each and every time. Fodera and Associates in the News!